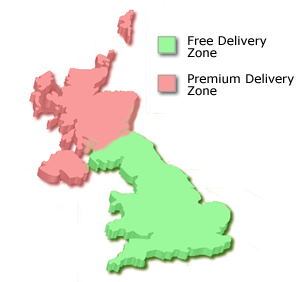 All of our products are priced inclusive of delivery to a mainland UK address within our free delivery zone (see map below). Deliveries outside of this area will be subject to premium charges on a quotation basis, please contact us for more information if you are in the premium delivery zone. We do not deliver outside of the UK, however we are happy for you to arrange collection via your own courier company, please ask us for more details. We aim to deliver orders within 30 days of order. Where this is not possible, we will contact you at the earliest opportunity to advise. Much of our furniture is available sooner. Both 48hr and Saturday deliveries are available on request and are subject to additional charges, please contact us for more information and a quotation. Delivery times are not guaranteed and should the delivery be delayed by factors beyond our control, we will notify you at the earliest opportunity. You will be contacted by either ourselves or the product manufacturer prior to your products delivery date to confirm. If your nominated day is unsuitable then please re-arrange this as failed deliveries can incur additional costs. Unfortunately our free delivery service does not guarantee a specific time and you must be available on the day to accept delivery. Sometimes it may be possible to specify AM or PM. Goods will be delivered to your door, our delivery contractors are not responsible for taking goods into your home or removing any exisiting goods. Our delivery contractors will not assemble any items unless pre-arranged. IMPORTANT - Upon delivery you may be asked to sign for your goods as received in good condition - please check items thoroughly - if this is not possible then please sign for the goods as 'Unchecked' or indeed 'Damaged' if the packaging is damaged. We cannot enter into any subsequent claims for damage to furniture if this procedure is not followed. If you require any further information regarding the delivery aspect of your order, please don't hesitate to contact us.